We are always very pleased to get feedback about this site, and to hear news and views about fine wine and food. We had been drinking wine for many years with enthusiasm when in 1995 we decided that the web provided a means whereby we could keep and share our tasting notes. Previously, we had both relied on scraps of paper with illegible scrawls and annotated lists from tastings that we diligently stored in the bottoms of drawers, where they slowly turned into coal. We made no effort to advertise the site, but we started receiving email from around the world and when we installed a visit-counter we discovered we had quite a large regular readership. We have given promises to many people over the years that we would upgrade the site, particularly by adding a search facility. Fine Wine Diary has now been online for several years. We hope you like it. 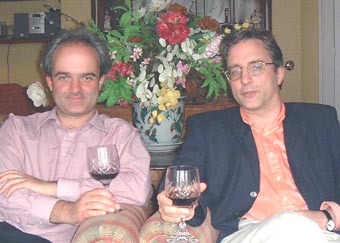 Richard Bailey (RJB - on the left in the picture) has been interested in wine (drinking and collecting) and food (eating and cooking) for many years. As well as tutoring wine appreciation at adult education classes, and leading many other tastings, he has been a judge for seven years at the International Wine Challenge. Nowadays, however, he likes to focus more on the finer side of wine, Old World, or New, and on adding to (and subtracting from) his cellar at home in Cambridge, England. Toby Bailey (TNB - on the right in the picture) has been drinking wine and taking an interest in serious food for as long as he can remember. (In fact, rather longer.) He started cellaring wine seriously about 15 years ago, and like many collections, his is in danger of growing out of hand. Having been through phases of enthusiasm for many things, his interests increasingly centre on the European Classics and the search for elusive great old bottles. He has lived for the last ten years in Edinburgh, Scotland.